Enron, December 2001, busted for wilful corporate fraud and corruption. The reported financial condition of this organization was sustained by creatively planned accounting fraud. Enron reported revenues of $101 billion in 2001, but when the fabrication was brought to light, the organization lost about $80 billion, then collapsed, and since became the popular Enron Scandal. WorldCom, July 2002, busted for misrepresenting about $3.8 billion in expenses – probably resulting from its $41 billion debt burden and the very ground opening up under it. This once large organization employed 60,000 people in 65 countries and claimed $107 billion in assets. Bankruptcy was declared and the organization was later folded into Verizon. The Sarbanes-Oxley Act was introduced in 2002, after the Enron Scandal, which directed that top management certify the accuracy of financial reports and penalize any fraudulent reporting – however this isn’t always addressed sufficiently by regulators. 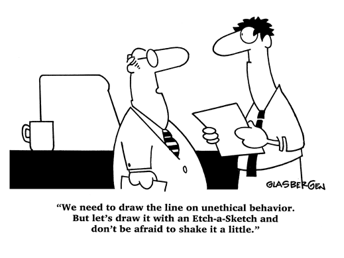 Regardless, the standards for ethical compliance have grown in the last few years. Many organizations are adopting elaborate codes of conduct, building self-reporting mechanisms, hiring chief ethics or compliance officers, and taking up sustainability initiatives, all in the effort to change their perceived image of being resource wasting entities. The new trend this season with businesses is to be certified as ethical, honest, and fair. This bold and colorful direction flatters an organization’s image in the eyes of regulators, investors, and consumers. A certified organization is serious about its social responsibility as it’s looking to grow in sustainability. How Does Your Organization Keep up With The “Jones'”? Litigation can damage an organization’s reputation and most organizations know this. That’s why chief compliance officers get the big bucks, so they can make sure their employer says on the up and up. Companies that are looking to avoid litigation also tend to have full disclosure policies – they practice what they preach and stand up for their core values no matter what. It’s in an organization’s best interest to comply with the ethical norms of it’s industry sector. Fraud and unethical practices force the leash to be tightened on regulation and nobody likes to operate in an environment where you can barely move without risk of being strangled. Case in point in 2007 after the financial crises, capital requirements were tightened and more checks and balances were put in place. Bank balance sheets have been seeping from paying out the fines imposed by regulators and settling court cases from mis-selling of mortgages and credit cards. Who doesn’t want to look good in the eyes of the public? Organizations want to make sure the public admires their operations. An ethical organization can build a strong sense of goodwill among the stakeholders. Here’s an organization we are all familiar with – Kimberley-Clark, kleenex, diapers, etc – who were criticized for using excessive environmental resources, and causing pollution and depletion. They needed to build up their “environmentally friendly” image, so are working with Greenpeace and World Wildlife Fund to help in forest conservation all over the world. When an investor is looking to invest in an organization, they are looking for an organization that is a leader in its industry – specifically in how it represents the causes of the industry – leads in innovation, and thinks about sustainability to survive. Ethical organizations attract customer loyalty, and customers bring business to an ethical company. And this is very true for consumer goods businesses. For example, a company that makes skin care or healthcare products will do well by fully disclosing the nature of its contents – chemical compositions and possible health hazards. Customers also value products that are environmentally safe. Most suppliers like to do business with a clean organization – organizations that respect the rights of workers and members of the communities where they do business. An example, Gap Inc. had a review of its processes and as such, is now working on developing safety standards, issuing mandatory factory inspections, and giving loans to factory owners to invest in making their factories accident proof. Oh, and they started a worker hotline. Organizations that are serious about corporate governance empower communities they work with, go out of their way to way to ensure environmental harmony, and promote good corporate ethics. The result – an impression of stability, commitment, and positive growth. One other area that should be part of an elaborate code of conduct is the implementation of a certified ethics reporting system, where employees and stakeholders can report any wrongdoing anonymously without fear of reprisal.